On my second blog tour stop. I interview, A. T. Balsara, the author of The Great and the Small. I want to know why an author stepped away from the traditional route of YA books, which usually don’t include illustrations. You’ll be surprised what what you find out. Hello, Andrea! I’m excited to welcome you to my blog. Thank you for taking some time to discuss with me about your book. And I’d love to congratulate you on your book birthday! Thank you very much for having me! I really appreciate it! You’ve just recently published a book. Tell us about it. Sure. The Great & the Small is the story of a colony of rats, led by their charismatic Beloved Leader that has sworn to kill humanity using the bubonic plague. When the Beloved Chairman’s nephew, Fin, gets rescued from certain death by a young “two-leg,” a teenager named Ananda, doubt creeps in about the war. Now Fin must decide: follow his beloved uncle and murder the two-legs, including the one he has grown to love or do the unthinkable…rebel. Your novel is one of the unique stories I’ve heard this year. So why did you choose rats for your protagonists? They were the ultimate enemy that could bring down humanity. They are smart, can chew through concrete, take down a grown cat, and multiply like…well, rats. They were the carriers of plague-ridden fleas, and were instrumental in killing almost half of Europe’s population during the years of the “Great Mortality.” Humanity does a collective shiver when we think about wild rats running amok. Can you explain your writing and drawing process? What inspired your drawings and writing for this story? For my writing, I think I’ve always been drawn to Tolkien, and his epic, all or nothing, type of story. I also loved the book Watership Down and loved how the author made you feel as if you were watching the lives of rabbits. I wanted the epic feel of a Lord of the Rings, combined with the intimacy of what it would be like to be this particular animal. It was incredibly interesting to me to write from a rat’s point of view. For the drawings, I wanted something monochromatic, so that it felt like it might be taken from old times. I love adding texture, and layers to the drawings, and used the computer software Corel Painter to do the illustrations. You don’t always see illustrations in YAs. Why did you include them in yours? I was told that young adults don’t read animal stories, that they don’t do illustrations…blah, blah, blah…in other words, the big publishers didn’t want to take a chance on a story that was outside of their lines of acceptable risk. There is far too much emphasis, nowadays, on staying safe in order to make a sure profit, than on publishing something that pushes boundaries and takes risks. I wrote and illustrated the story I wanted to read. If I had listened to the gatekeepers at the big houses, I would’ve been bored out of my mind. When did you first realize you had to write this book? I had gotten the seed for this story many years ago when I visited a concentration camp museum. From that moment, there was a burning need inside of me to make a difference, to try to do my part to shine a light. I wrestled with the question of what makes someone capable of doing such heinous acts. In writing this book, I took my question to the next level, and asked, if you were raised in the orbit of one who did such acts, could you save yourself, or were you doomed? The Great & the Small was my attempt to work through those questions, but it was painful. Most of us aren’t devils or saints but fall somewhere in between. It was painful exploring that light—and darkness—within myself. What do you want readers to take away from it? There are many things. The most important thing is that no one is born evil. So-called “evil” people are made, usually slowly, by the choices they make. Many of us feel we have no choice, that we are helpless within our own lives. Not true. We always have a choice. The Nelson Mandela of the world teaches us that no matter what happens, you have a choice. The other thing I would say, and I will quote Balthazar, a wise old rat in The Great & the Small, on this one: “Seek Truth.” I believe that the truth really will set you free. But it takes soul-searching, and a willingness to deal with our own garbage. What was the most difficult part in creating The Great and the Small? Persistence. This story took me close to 15 years to write because projects would come up, or opportunities, or life, and I would have to shelve it for years at a time. It was hard to have to dust it off, reread it, realize with horror that it needed a complete rewrite, keep going, and then put it on the back burner…etc. etc.…it was a loooong process. Recently, I came across an old CD from 2012; it had a copy of the manuscript, and was labeled, “final draft.” Seeing that made me burst out laughing. The book has been rewritten a million times since 2012 (okay—not a million; it just feels like a million!!). If I hadn’t loved the story so much, I would have given up a long time ago. Guess who’s back on the blog? Collin Piprell! The author of MOM and Genesis 2.0 from the Magic Circles series sat down (digitally) to talk with me about his new book. I’ve been wondering how this insanely thought-up series will go, and finally, we get to find out. Genesis 2.0 is now available online! Hey, Collin. Welcome back to my blog. I’d like to congratulate you on your latest release, Genesis 2.0! You’re on your second novel in your Magic Circles series. Can you explain what’s happening in Genesis 2.0? What are Cisco and your other characters facing? The book begins with a new character, a young man who negotiates a grueling gauntlet through the terrifying world Outside that we saw in MOM. He eventually encounters survivors of MOM’s cast of characters. Some of these have come to resemble the Olympian gods of old. Cisco himself resembles a hero out of myth, operating in both Aeolia, a virtual realm, and in mondoland, the ruined remnants of the pre-PlagueBot world (real world). The story involves (1) a titanic contest between our villain-in-chief Brian Finister and the AI that superseded him as MOM (mall operations manager), (2) another contest between the personality alters of the fragmented AI MOM, (3) contests between our young heroes (Cisco, Dee Zu, and Son) and the Olympians (and others), and (4) two different love triangles with all the attendant drama. What surprised me the most is how the former generated reality test pilots don’t know how to survive in the wild (the real world). They’ve lived in malls for most, if not all, of their lives. This dependence on technology smacks you in the face when you read Genesis. Were you hoping for that effect from readers? Is there some message you are hoping to impart? For a take on the outsourcing theme, you can visit this blog post: “Outsource our minds? 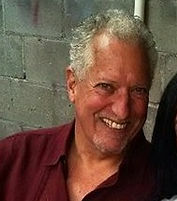 What a good idea.” http://www.collinpiprell.com/outsource-our-minds-what-a-good-idea/. Even without all that, imagine your average modern urbanite reduced to living off the land. Would they have the skills to find food and water, to find adequate shelter or defend themselves against physical threats from animals and other people? Cisco’s (the main character) world has fallen apart. His life is turned upside down at the end of your first book. What is his frame of mind in the sequel? What is he fighting for? He finds he’s even more in love with the “wet” Dee Zu that he was with the virtual variety. And the Lode has enough of Cisco—enough of the “right stuff,” the properly stressed personal data—that, as he has already proven, he’s capable of ascension as an autonomous ebee to Aeolia, Sky’s qubital alternative to mondoland, or what you refer to above as the “real world.” He wants to ensure that Dee Zu survives long enough the Lode can absorb enough of her data that, should the wet Dee Zu die, she also has this option of a second life in Aeolia. At the same time, Cisco is co-opted by Sky, serving as her agent in resisting both Brian’s machinations and the attempts of Mildread, one of Sky’s personality alters, to shut down Sky’s Aeolia project. Who or what inspired you to write Brian and Sky (the antagonists)? Sky, to some limited extent, is a virtual version of the ancient Pygmalion story. A human creation that comes to life in a way that causes people to become infatuated, even sexually embroiled with her. But that’s a real stretch, and is misleading. Other than that, I wanted an AI with human qualities, at least in part, and discovered a fine source of dramatic conflict between a machine MOM (mall operations manager) who has ascended to self-aware autonomy, and Brian Finister, the megalomaniacal last human MOM, whom she superseded. What was your favourite part in writing Genesis? I enjoyed writing all its various parts, but maybe I had the most fun with Brian. First of all with his “despatches,” his raving fulminations and attempts to supply a history for a future readership he believes will never exist; and, secondly, with the chapters where his scendent personality fences with the super-intelligent Sky, determined to prevail in the end, no matter how unlikely that outcome appears. Can you give us a glimpse into your third novel, Resurrections? To reveal the essential theme and plot device would prove a spoiler for readers of Genesis 2.0. The best I can do is say that, underlying MOM and Genesis, we find developments that point towards a game-changing evolutionary emergence. This element is brought to surprising conclusions in Resurrections, and our heroes (including, again, new characters in addition to the old cast) have to cope with these developments, which offer at once huge promise and dire threats for the future. 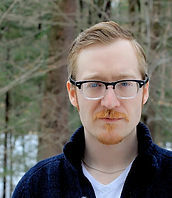 I had the pleasure of interviewing Jesse Miller, Common Deer’s newest author. While discussing the Common Deer Press’ Fall 2017 lineup, Elizabeth, publisher and friend, mentioned Unwrap Your Candy. Let me tell you I wasn’t expecting a book about man who works at a condom factory, loses his mind, then leaves and his job, all in one night. But since I saw the first page, then the condoms and cigarettes sparkled throughout the book’s design, I knew I was in for a fun read. Don’t miss out on this book! It comes out on September 10th. Welcome to my blog! Thank you for taking some time out of your day to have an interview with me. And congratulations on your upcoming book birthday! Can you tell readers what your book is about? Thanks for having me aboard your blog! Describing this thing I’ve created is tricky for me. Even though I’m the one who created it, the book may be something very different to me than it is for others. But I’d say, Unwrap Your Candy is about being madly in love with and consequently, blissfully intoxicated by language. It’s the story of Thom Evans and a day/night he spends after he leaves his miserable job at a condom factory for a night on the town with his compellingly attractive, but seriously wounded lover, Samantha. The tagline my publisher came up with is choice, something like: Imagine Woody Allen made a movie about Dilbert and James Joyce wrote the screenplay. That’s what you should expect from Unwrap Your Candy. Really, UYC is a book of chapters, and perhaps the non-linearity of the narrative might be a barrier for someone to push through. But if you can get past some of the construct mechanics, it’s really a book of songs, with recurring phrases, with recurring lyrical motifs, many of which are introduced in a kind of overture at the beginning, stretched and unpacked as the book spins on, and then brought around in the close. I suppose that sounds kind of absurd, and perhaps worse, pretentious AF, as the kids might say. How about this: it’s a concept album in the form of a novel. Why did you plan to write it? Was there anything that gave you inspiration to do so? The real germ of UYC came from an article I read many, many years ago in one of those douchebag men’s Maxim-y magazines. I was sitting there in the waiting room at the dentist’s office and the cover had a little blurb: “The Magical, Mystical Condom Factory Experience!”—some such nonsense. I think the angle was like this Willy Wonka-esque tour through the factory as told by a kind of “with it” Hunter S. Thompson narrator-type driving the story. What struck me most was how during the tour, the writer wasn’t allowed inside certain rooms—I’m sure this is standard procedure, but he made such a huge deal out of it, out of this barrier, this kind of off-scene place. It got me wondering: What was beyond those walls? And then some lyrical part of my brain took over and wondered what that all meant—the barrier, the NO that existed in a space that made barriers. From there, the unknown, the beyond, and not just the actual room in the factory, became the quest. And then in time, the mood and the undercurrents of the book started to take shape. Can you also talk about your main character, Thom? How did he come to life? Thom came to life for me in the ensuing years after I had written a full draft and had put the book down for a while. There was something about his “condition,” self-imposed as it is, that some part of my brain couldn’t stop returning to it. It was a kind of unresolved melody bouncing off the walls of my cranium, trying to get out. I suppose then, so much of Thom experience is a sense of purgatory, even in, and perhaps especially in, his youth. The book is prefaced with a portion of Tennyson’s poem Tithonus, and as misguided as Thom may be, I think he identifies with the unresolved condition Tithonus experiences in the poem—the sense of being shielded physically but not protected emotionally…feeling powerless as you watch everything decay. It’s odd, but that kind of chewing on a heavy poem for years, and returning to some lines you might mutter to yourself or anyone in earshot, at questionable times even, feels real to me, makes Thom real to me, anyway. Of course, when I first started the book, I was roughly about the age of our dear punchinello. I was once a young, anxious man vibrating with the exotic narcotics of adrenaline and hormones, trying to figure out how to exist inside my own skin. Interestingly, it was ultimately in my aging, in my removal from the kind of “condition” of this character that I suppose I could see Thom, and write from a perch where I was capable of looking back to make some out of meaning of the flurry of his youth. I always thought there was a dark humor in this book, but as I’ve worked on the revision, and the countless other revisions, and as life has worked on revising me—I suppose I’ve appreciated the humor in the Thom’s self-created folly more and more. You’ve published a novel before. What have you enjoyed about this book’s publishing process? I’ll tell you, this has been a remarkable experience. The good people at Common Deer Press have been extremely receptive to how I envisioned this book finding its form in the world. I particularly loved the way the dust jacket came out—that long phallic factory stretch into infinity just kills me. And the 3-tone trinity spareness of the cover gives me chills, gives me that rockin’ pneumonia of, say, a White Stripes album. 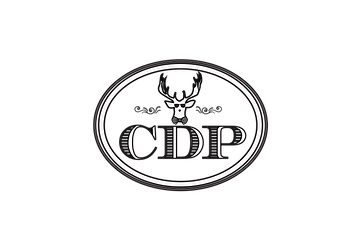 I am thrilled (to) be part of CDP and to bring Unwrap Your Candy into the world! This is, well, an unconventional novel, which drifts way out there at times, and it is only fitting to work with a unique publisher so keen on presenting the work in its proper form. CDP gets this book, and I very much looking forward to the unwrapping. You’re a visiting lecturer at the University of New England. Why did you decide to choose literary fiction over other genres? Is there something that sets it apart? I am! I generally teach writing courses at UNE, including creative writing courses. Choose literary fiction? That’s not exactly it for me. Really the question is: What is literary fiction? I’m not trying to be bratty, but it’s worth considering. It’s certainly something we wrestle with in my writing classes. As I understand G E N R E, with a capital G—as both a writer and a teacher of writing—is that other genres radiate from literary fiction, and we receive their rays on many different planets. Literary fiction, for me, without putting too fine a point on it, is a home-base of sorts, an incubator, a kind of Rome from which all other genres widen and radiate. And that’s what makes other genres interesting, in their reach and radiation from home-base. And really, UYC is a probably a little bit of a transgressive book in the truest sense and in the genre sense. But I don’t really live and die by genre. Literary fiction so often has elements of other genres. Christ, one of my favorite short stories, The Swimmer by John Cheever is really a ghost story. I love reading that story with my fiction students as “literary fiction” and then looking at from another genre-y lens. EXPLOSION! Students come in loving stories, so I really try to avoid being sclerotic with how I define or have them experience fiction. Tell me a story. Make me care. Avoid cliché. Get out of your comfort zone. That’s really my ambition in the classroom and at my writing desk. Are you planning to write more books in the future at all? Beyond that, I’ve been writing an eschatological novel, a kind of mosaic for years and years now, which feels like with just my luck, that I’ll finish just in time for the end of the world. I’m calling it the WAX novel at this point, like drip candles that accumulate on prior drippings, because it seems like with this project I keep returning to it, burning over for a while when I can really focus; and then I’m back teaching, and that kind of singular focus I need evaporates. The cycle has been going on for a long time, writing in fits and bursts… falling into the book, back again, and then I’m gone again. The process of coming and going in and out of the book, that wax and wane, is having an impact on the style of the prose for sure. Today’s my second stop on the blog tour! I had the pleasure to read an eARC of MOM by Collin Piprell. And I had to learn more of this futuristic world, so I set up an interview with him. MOM is one of the most complex multi-layered stories I’ve read in a long time. Can you tell the readers what it’s about? That may be true, but I’d like to reassure readers that the novel focuses on dramatic developments between the characters — the heavier themes and multiple dimensions frame the action without intruding on what’s otherwise just a rollicking good read. MOM is the “mall operations manager,” a machine intelligence become self-aware. And one theme in this book is the question of reconciling machine and human evolution. MOM also takes disintegrative trends in our current material and cognitive worlds and extrapolates to what may not be unrealistic extremes in the not very distant future. Forces for disintegration contend with reintegrative moves as background to the dramatic conflicts. In the Magic Circles series as a whole, this becomes in part a contest between opposing cosmic imperatives — call it a war between the urge, on the one hand, to bring everything in the world under the control of one agency in the search for absolute security, and, on the other hand, the acknowledgement that error and diversity and conflict play essentially positive roles in our experience, essential to our staying open to the rise of real novelty — what some describe as creative emergence. In fact, the story eventually proposes novel developments at least as revolutionary as the rise of life itself, or cultural evolution’s supersession of biological evolution. That thread is developed more surely as the story unfolds in Genesis 2.0 and Resurrections and beyond. Here I should say again that, despite all that, MOM basically presents a ripping good read. And so my dear, departed mother would agree were she still with us. MOM has been published before. Can you explain what has changed from the first publication? Not much has changed. The publisher chopped about 10,000 words (10 percent) — mostly a first few chapters I’d thought were needed to introduce readers to life in the malls and in the Worlds — and I had to agree that, after I wrote patches, the book now gets off to a faster start, while nothing essential has been lost. Other than that, it’s pretty much the same book. I’d had the ruins of the Baiyoke II Tower, formerly the tallest building in Bangkok, poking up out of the sea that surrounds the Eastern Seaboard, Southeast Asia (ESSEA) Mall. In the current edition, I’ve substituted the MahaNakhon, an even taller building that’s almost finished. I see that Bangkok holds a special meaning to you. Why have you incorporated it in your stories, especially this one? I’ve lived in Bangkok for quite some time, and it seems natural to borrow settings from that city and the rest of Thailand. MOM is set in (1) the ESSEA Mall, what remains of a coastal megalopolis; (2) generated realities set in 1980s-90s Bangkok; (3) a subterranean site beneath a much-changed landscape several hundred kilometers north of Bangkok; and (4) the Eastern Seaboard, United Securistats of America (ESUSA) Mall, roughly where New York used to stand. What inspired this futuristic sci-fi? Has recent (or older) technological advances inspired the book at all? I believe nanotech and qubital computing will together transform our lives far more than the digital revolution ever has. And — like the digital revolution, or the Industrial Revolution before than, and so on back to the rise of agriculture and cities and to even earlier radical transformations of our human worlds — these technologies will bring new advantages, some of which would seem miraculous to people from our time. At the same time, they’ll bring new problems, some of them so horrendous as to threaten the extinction of all life on the planet. At the start of MOM, the PlagueBot — a global superorganism emergent upon a failed “gray-goo scenario” involving self-replicating nanobots — presents one of these threats. But nanotech and qubital computing have also provided fixes, however inadequate, by way of the malls and the Worlds, among others. Much of the drama arises amid the ever-accelerating failure of these fixes. Later in the Magic Circles series, we see what looks like the end of humanity and the rest of the planetary biosphere transformed into a strangely familiar but in fact radically new basis for Gaia 2 and a human renaissance. Can you explain to readers what worlding is and what’s its purpose in this dystopian world? How did you come up with the concept? How does it affect Cisco and others? Worlds UnLtd is an infinite manifold of interactive, totally immersive generated realities accessible to denizens of the malls on certain days. These are the only escapes from the quarantine imposed on the mallsters. Except for telepresent encounters in their holotanks or in the Worlds, these few surviving people are kept strictly isolated both from Outside and from each other inside. One of the early mysteries in MOM is why it’s an offlining offense to try entering the Worlds on a Monday. Another mystery is why the ever-more frequent Mondays are getting longer and longer. Meanwhile “to world” has become a verb, and people can be more or less adept at worlding. Because of their special training and experience, Cisco Smith and Dee Zu, two of the main characters, are Worlds test pilots, making sure they’re safe for the average mallster. The Worlds — realer than real, higher-rez and infinitely customizable — are utterly addictive, and most mallsters, if they could, would spend their entire lives in them. Now you’re expanding on your series, what are you looking forward to in the next instalments? What do you have planned? In MOM, I established a variety of fictional “worlds.” When I started writing Genesis 2.0, I was delighted to find that, rather than creating worlds, it was more like I was exploring worlds that were already there. Implicit in the settings that underlay the dramatic action in MOM I found all kinds of new features and dimensions. The same thing is proving true as I work on Resurrections. Much of the pleasure of writing Magic Circles, one reward for all the hard work, has been this excitement at learning what happens next and where those developments are going to lead. Today, I am excited to announce the release of Rex, by Adam Rocke, Mark Rogers, and Cody Stewart. I’ve set up a spotlight and a Q&A with the authors! I’m in love with this book and can’t wait to see it released for everyone to read! What sparked your idea(s) to write a story about a boy and his t-rex? Have any books or movies inspired you to write this story? 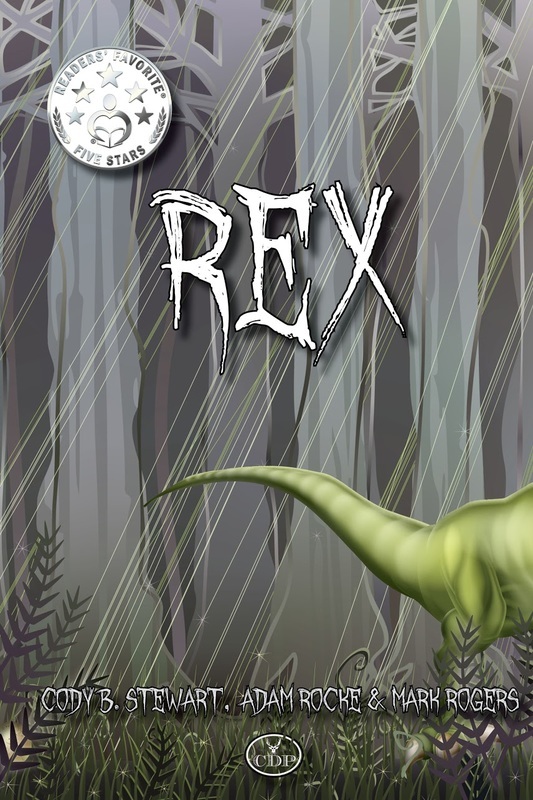 The inspiration for Rex stems from a “swamp survival” course I did in the Florida Everglades. While I didn’t find any dinosaur eggs—or any spooky CIA secret agents for that matter—I did find a few alligator snapping turtle eggs, and these got my creative juices flowing. The scenery in there is so amazing, and when it gets dark—whoa! It’s like a whole different world. The Everglades is really a character unto itself! I was a bit of a TJ myself, heading into the woods every day at the age of five until seven years old, for full days of looking for box turtles, salamander, and huge beetles living in logs. These were great days without a grown-up in sight. I have a lot in common with TJ. My brothers and sisters were all out of the house when I was around TJ’s age, and I lived in the middle of the Adirondacks, so there weren’t many people around. I spent most of my time making up stories as I explored the woods. Those stories always involved me running around with fantastic creatures. This book is a joint project from all three of you. What drew you to be a part of this book? Who contributed to what? My inspiration was meeting someone as rare and strange as Rex – Adam Rocke. He invited me in to add a little extra something to the Rex project. We had written another novel together and knew we had what it took to create a book that was greater than the sum of its parts. Then when Cody joined in, the magic took off to the nth power. I’m incredibly grateful that Adam and Mark invited me to be part of Rex. I’ve learned so much about writing and the writing business from them and the process. Accepting their invitation was a no-brainer for me. They were positive that they had a great story to tell and that it would take off. And they were right. Rex is a story with so much heart, humor and adventure. I jumped at the chance to help shape it. Many people have gained a love of dinosaurs over years. What do you believe interests readers on their love of dinosaurs? For me, dinosaurs are the ultimate story creatures because they’re real. At least, they were. Grasping the concept that actual monsters once roamed the earth is really cool. And to think, maybe they’re still out there somewhere. Just because we haven’t found yet doesn’t mean they no longer exist. In the deepest depths of the ocean, or somewhere in the lush jungle, maybe, just maybe, there are leftovers from a prehistoric era. I’ve never met a kid who didn’t love playing with dinosaur toys, reading dinosaur books, or seeing their bones in a museum. Part of the appeal for kids may be because dinosaurs roamed the earth before there were schools, chores, and big people telling you what to do. Also, with all of the scientific strides being made, who’s to say a Jurassic Park scenario is impossible? Dinosaurs make the ultimate What if? story. What if they never went extinct? What if humans and dinosaurs lived side by side? What would it be like if dinosaurs existed on our modern day earth? It’s fun to imagine because they really did exist, not like unicorns. And, really, unicorns are just horses with horns. Not that awesome. But dinosaurs are practically dragons that walked on the same ground that we walk on now! Congratulations on the potential movie deal! What are your thoughts on Disney, 20th Century Fox, and Sony Pictures circling your book? The thought that our story could actually be made into a movie is incredibly exciting. From a writer’s standpoint, it’s always flattering to have people respond to your writing. And the fact that so many people have responded thus far takes that flattery to another level. But it’s important to remain level-headed; Hollywood is filled with almosts and near-misses. Just because we have a ton of interest doesn’t mean we’ll land a deal. And even if we do get a deal, that doesn’t mean a movie will ever get made. But still, it’s awesome to sit back and watch it all unfold and we’re all truly appreciative of the time and attention that Rex is receiving. I don’t even really comprehend the question. It doesn’t seem real. Actual living people who work for the biggest companies in the film industry have read something that I wrote and at least thought, “Well, this isn’t the worst.” For me, that alone is a win and incredibly flattering. But, like Adam and Mark said, there is no guarantee a Rex movie will happen, so I try to stay grounded. Still, that doesn’t mean I don’t imagine what I’d name the dinosaur I genetically engineer with all my Hollywood money. His name would be Newman, and he would be a triceratops.